The 37.3 metre motor yacht Chrimi II, listed for sale by Peter Hurzeler at Ocean Independence, has been sold with Oscar Romano at Benetti introducing the buyer. 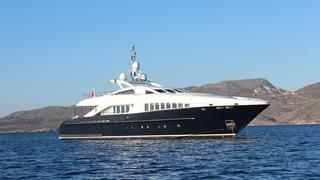 Built in aluminium by Dutch superyacht yard Heesen, Chrimi II was delivered in 2006 to a very experienced owner and has since been carefully maintained. The spacious and luxurious main saloon and dining area provide an informal area for relaxing indoors. The area is light with cream leather sofas and feels very comfortable and open, offering space for eight to 10 guests to dine at a round dining table. Accommodation is for 12 guests in five cabins. The master suite is full beam forward on the main deck while below there is a VIP suite with a queen sized bed and two further doubles. There is also a children's cabin with four bunk beds and all cabins come complete with en suite bathroom facilities. Chrimi II boasts impressive deck areas for her size with the sun deck accommodating a large Jacuzzi surrounded by white sunbrella sunpads, a wet bar, a Teppenyaki grill and a shaded dining area. An additional sunbathing area lies forward of the bridge and provides panoramic views while underway, and the main aft deck offers a more formal location for al fresco dining or relaxing. Twin 3,626hp MTU engines power her to a range of 2,000 nautical miles at 12 knots. Chrimi II was asking €6 million.